The revelations made recently by a former member of the Polisario, who left the Tindouf camps and returned to Morocco, say a lot about the genesis of the Western Sahara conflict. Semlali Aabadilah has indeed revealed an important aspect of the history of this conflict which has been so far surrounded by a lot of mystery. The trick used by Algeria and the Polisario when they triggered the Western Sahara conflict consisted in conducting a systematic propaganda targeting in the first place the Sahrawi students settled in Europe, especially in Spain and France. Algerian touts used photoshopped pictures to convince the Sahrawi students that the Moroccan army was driving the population out of Western Sahara aboard trucks. Semlali Aabadilah, who was in France, believed the story and once he graduated, he went directly to the Polisario-run camps in Tindouf. However he was not long to discover the deception and realize that the Sahrawis were actually held in a quasi-detention in the Tindouf camps. The vehicles driving the Sahrawis from their hamlets in Western Sahara to Tindouf during late 1975 and early 1976 were not Moroccan trucks, but troop transport trucks of the Algerian army. 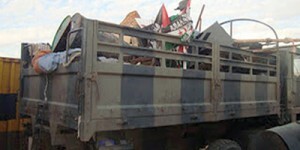 Between 80 and 100 Algerian military vehicles were in a race against the clock to carry a maximum of Sahrawis to Tindouf. But the most chocking news Semlali Aabadilah was told by his countrymen is that the overwhelming majority of Sahrawis were forcibly taken away from their families. Algerian soldiers, using sometimes force and some other times persuasion but always presenting Morocco as the bad and the Polisario as the good, separated thousands of Sahrawi families, says the Polisario former member. The result of this forced dismemberment is still tangible, with families having had a part of their members moved to Tindouf while other members stayed home in Morocco. The most telling example of this situation is that of the Polisario chief himself as his own father and brothers still live in Beni Mellal (a town located 200 km east of Casablanca.) And this is the case of thousands of Sahrawis. Those who were moved to Tindouf were subjected to a Stalinist indoctrination, exacerbated by the isolation of the camps from the rest of the world. “My parents and grandparents who stayed in Morocco were right when they did not believe the Polisario propaganda and slogans,” says Semlali Aabadilah bitterly.